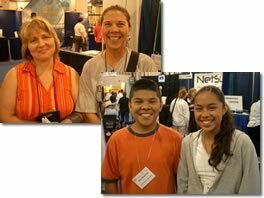 Remember the National Educational Computing Conference that took place in June? Well, I have more recordings to post! In this recording I speak with two teachers and two students from Mattawa, Washington who presented at the conference. You'll learn about a variety of commercial Palm applications used by these folks. The latest version of Documents To Go (7.0) features the SmartChart feature where you can graph your data right on the handheld. You can even choose the colors of your graphs! MathAmigo is used to try to get students up to grade level by customizing the instruction for each learner. Audible reads stories to you. Additionally, ImagiGraph was used throughout a student's seventh grade algebra class and was a big help. Isn't it just amazing how much educational software, both commercial and freeware, is out there for handheld computers? Click here to listen to 5 minutes and 30 seconds recording.